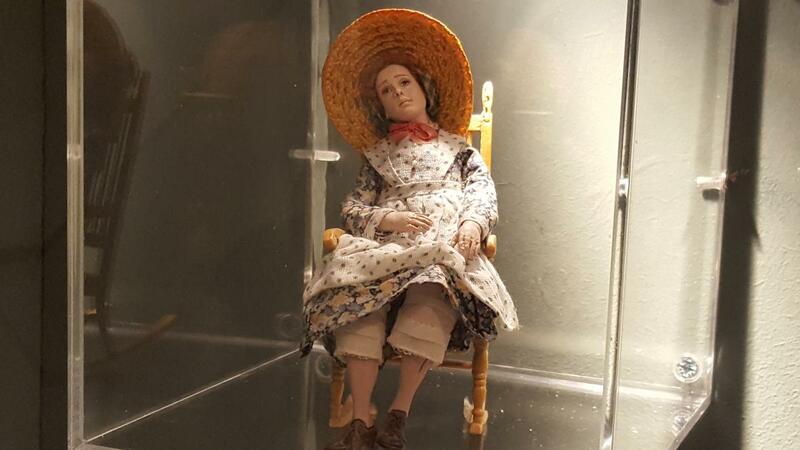 Here at Settle Stories HQ we’ve been collecting stories, stories of people's favourite dolls and teddy bears for some time for our exhibition, My Favourite Doll at the Listening Gallery. So, two weeks ago, the team took a trip to Newby Hall to visit their Doll House exhibition, an excellent opportunity for us to learn more about the history of dolls and teddy bears and share some of that with you. 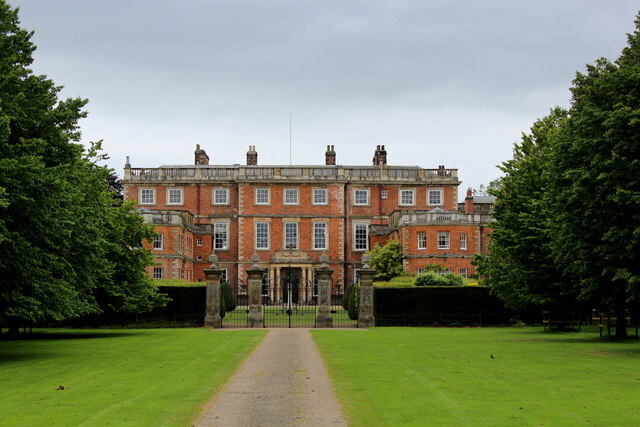 Newby Hall is an 18th-century country house situated beside the River Ure at Skelton-on-Ure, near Boroughbridge in North Yorkshire, England. The grand manor has been passed down from generation to generation and stood the test of time, looking just as impressive now as it did when it was constructed hundreds of years ago. Upon arriving we were welcomed with a downpour of rain, however the warmth of the Doll House museum invited us in to which we were greeted by a vast and beautiful array of Doll Houses of all shapes and sizes, each one crafted to perfection. Every piece told a different story or created a different feel. 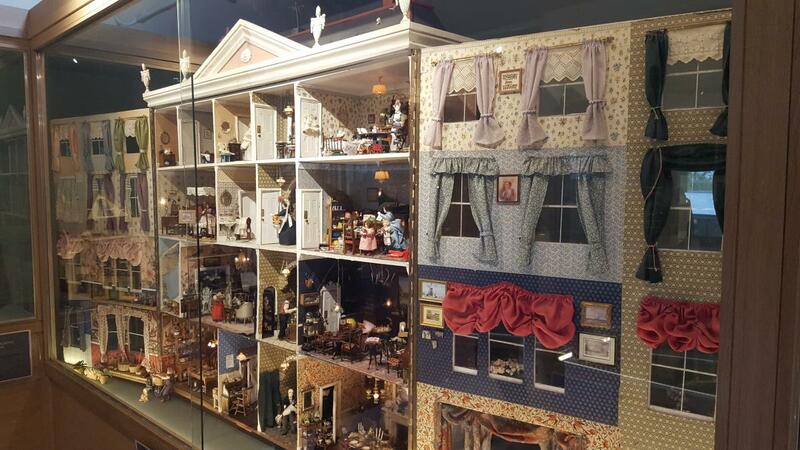 The Dolls houses featured different time periods and showed what life was like in particular eras. Here are some of our favorite Dolls Houses. Beagle House - The largest House of the exhibition was a spectacle for all to behold. Dwarfing all the other Doll houses the Beagle house took a whopping 6 years to completely fill. The Beagle House retains a vintage feel to it and even contains hidden secrets. Inside this particular house there is a China Dog lurking in nearly every room, hence the name Beagle House. The Beagle House was created in Richmond Adult College and features Germanic influences from the early 20th century. Hole in skirting board Mousehouse - While not quite the colossal size of the Beagle House, the Hole in skirting board Mousehouse is certainly one of the more creative pieces in the exhibition. Created in 1997 by Michael Browning, a specialist in creating Doll Houses from Wood - The Mousehouse is supposably home to a family of Mice. What's interesting about the Mouse house is that its made from mostly disposable items. For example the cupboard is created from a Matchbox, Glass Fruit dishes are made from Buttons and the Cookie Dish is simply just a beer cap! Inside this small yet beautiful house we can see there is a festive mood and the mice are clearly ready for Christmas. Biedermeier - A 3 story English House which has become the home of an Austrian Opera singer who, having escaped the turmoil of Central Europe in the early 1900s, has brought her fashionable “Biedermeier” to Cheltenham, where her talents are much in demand. The House has a large and beautiful lobby area on the bottom floor a living area on the middle floor and the top floor consists of a luxurious bedroom. This impressive house was crafted again from wood and features luxury items only the wealthy would have access to, items like golden chandeliers and mirrors just to name a few. As amazing as these dolls houses were, there was far more to explore. Situated just next to where the grand Doll houses, there was a wall containing to scale figures and props. These small figures and props were so small some smaller than your fingernails! Despite their size they maintained an excellent amount of detail, these exhaustive artifacts could only have been created by the delicate touch and eyes of a skilled artist. From vintage film cameras to to dolls dressed in attires that date back to recent and distant centuries and everything in between, truly amazing to behold. After the Doll House exhibition we decided to brave the weather and outside, across the lawn to the log cabin where the teddy bears of Newby Hall live. 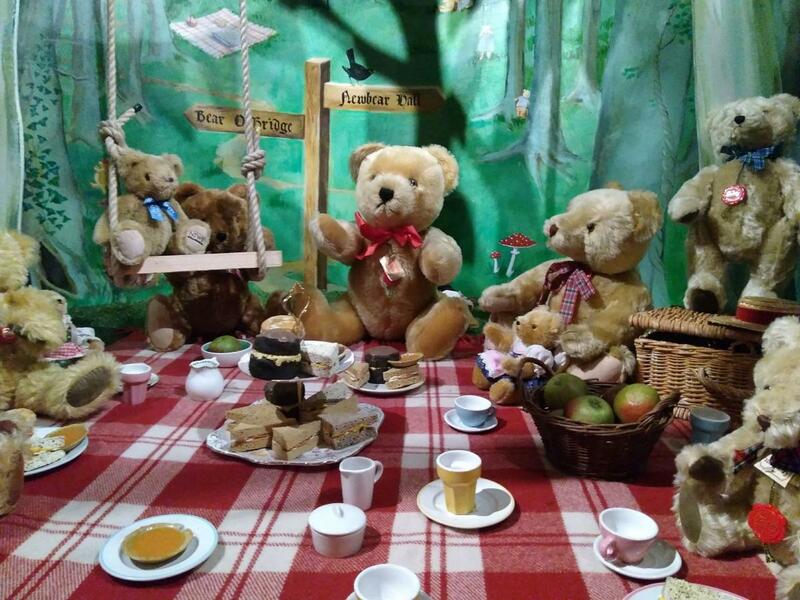 The Bears which have been lovingly collected over the years by Gyles and his wife Michele are permanently on show with various guises and scenes.The couple have 3 children and needed a place to home all their bears. After they appeared on The One Show for the BBC they discovered Newby Hall, they also learned that it would have housed the Royal Family in both World Wars had Britain been invaded and so in the couples own words; “If it's good enough for the Royal Family it's good enough for our Bears” and that was that. For those who don't know, the Teddy Bear owes its name to President Roosevelt. One day whilst out hunting, his fellow peers caught a large brown bear and requested that Roosevelt have the honour of shooting the bear. However Roosevelt rejected the offer as he exclaimed he couldn't take an unsportsmanlike shot. News spread of this event and so did cartoon based accounts starring both the President and the Bear, they proved to be extremely popular and a small shop owner who specialised in making stuffed animals had an idea after seeing the cartoons popularity. With permission from Roosevelt the shop owners created a stuffed bear named the ‘Teddy Bear’, It was an instant hit and soon bears were created across America and Europe! While all the bears were magnificent, some stood out from the rest, for example Teddy. This Bear belongs to a very mischievous man - Mr Bean, the bear is quite simply called Teddy. Mr Bean and Teddy have been on many adventures together and are often seen as inseparable. Teddy celebrates his birthday on the 15th of August, however he now lives a much quieter life at Newby Hall. Made from mostly string, Teddy is a very simplistic creation and features buttons for eyes and a solid brown complexion. Teddy was the brainchild of Richard Curtis and was created to be a loyal companion for Mr Bean. We wonder what his favorite adventure has been so far! The Newby Hall Teddy Bear’s Picnic - 14 Teddy bears have attended an organised picnic in the woods! Together they sing their favourite songs, the teddy bears picnic, which was composed in 1907, but the words weren't written until 1932, a quarter of a century later. Some things can't be rushed - especially by teddy bears. The set features nice artwork to create an outdoor feeling. The scene really reminds us of those glorious Summer days where the whole family would get together to enjoy a nice delicious picnic. Newby Hall was certainly an excellent experience that all the team thoroughly enjoyed, much was learned about all the different kinds of Doll Houses and Bears and even though the weather was not on our side our spirits remained high from the moment we ordered our tickets to the moment we left. Newby Hall provided us with an excellent day out and a lovely time to catch up with all the team after the long but highly successful Festival. If you want to discover stories of people's favourite dolls and teddy bears, do visit our audio exhibition in the Listening Gallery.